I did a brief post on these little weirdos in the early days of this site, but thought it was about time to come back to them. For one, I've since taken new, better photos. Also, they're so bizarre and cool that they deserve more discussion! For those not already familiar, these are hard plastic, Monster in My Pocket-sized figures that were sold (I believe) during the 1990s as bagged sets under a couple different names: "Terrible Monster" and "Monsters & Goblins." I've seen them associated with a couple different company names, including Hing Fat and Fishel. 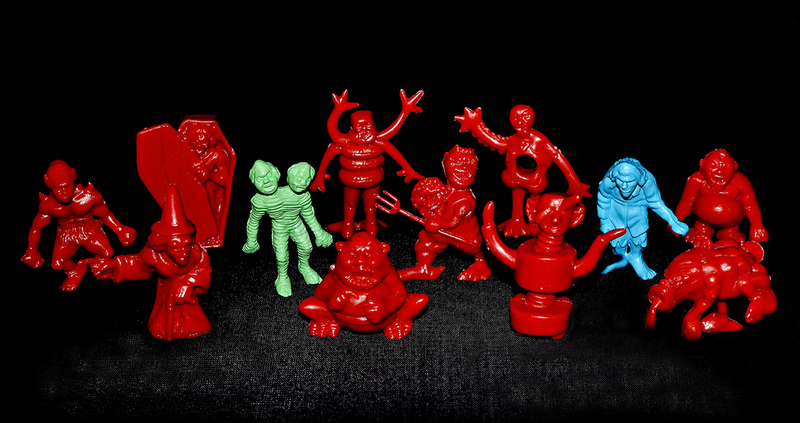 There are 12 different figures that came in four different colors: red, blue, green and yellow (no yellow ones are pictured here). The sets came with a larger monster tree to go along with the other figures (sadly, I haven't been able to get a hold of one of those yet but you can see it in an auction photo if you go to the older post linked above). They show up in lots of mini figures every so often, but their origins are still kind of mysterious. When exactly did they come to be? Were they sculpted specifically to be sold under these names, or were they bootlegged from something else? Are those supposed to be fat rolls on that one guy? We may never know the answers! LEFT: This guy is basically a blob with a gaping hole in the middle of his abdomen and birdlike limbs. It makes absolutely no sense (like most of these figures), and I dig that. CENTER: Here's the fat roll guy I was referring to. They're probably actually supposed to be snake coils or something, but whatever. This four-armed dude is another of the strangest monsters in a set full of strange monsters. RIGHT: To me, this is actually the creepiest figure of the set. There's just something about a wheeled robot with serpentine arms and a somewhat human head that has its eyes wildly boinging out that I find unsettling. It's like something you'd see in a nightmare after spending the night getting drunk and watching '50s sci-fi movies. I love it. LEFT: While most of the other characters are truly unusual monstrosities, this is a pretty standard representation of a witch--not unlike one that you'd see on a Halloween decoration. I'm not compaining, though. I can always get behind a witch mini figure. CENTER: Instead of just opting for a standard mummy, the creators of this set decided to make this guy a two-headed zombie-mummy. Thanks for that, whoever you are. RIGHT: Here we have some sort of humanoid mutant creature who looks like he'd be locked in the dungeon of wherever these Monsters & Goblins reside. LEFT: What the...? I don't even know. CENTER: Another one of the less-bizarre creatures of the set--a vampire or ghoul emerging from its coffin. 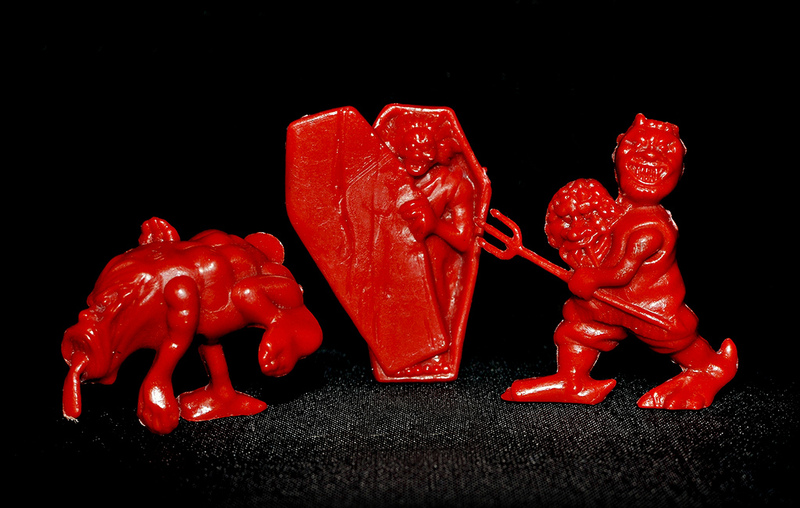 It sort of reminds me of one of the Vampires mini figures by H.E.I. that was out probably around the same time as these. RIGHT: This guy is awesome. He's like a demon or devil character, but his pose, gleefully evil face sculpt and wacky monster head that he's holding really crank the whole thing up a notch. 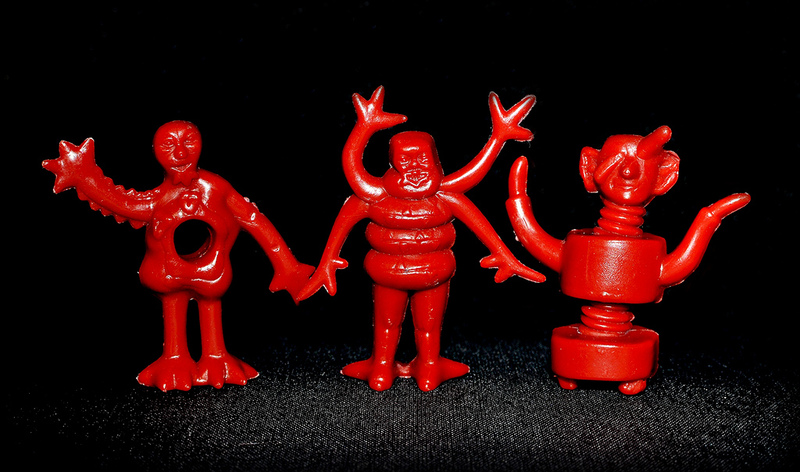 LEFT: Oddly enough, this set consists of two different tubby, pot-bellied little monsters. This is one of them. This is a fun sculpt. I love his wretched facial expression. CENTER: This guy's probably the least interesting of the set, but he's not bad. A zombie? 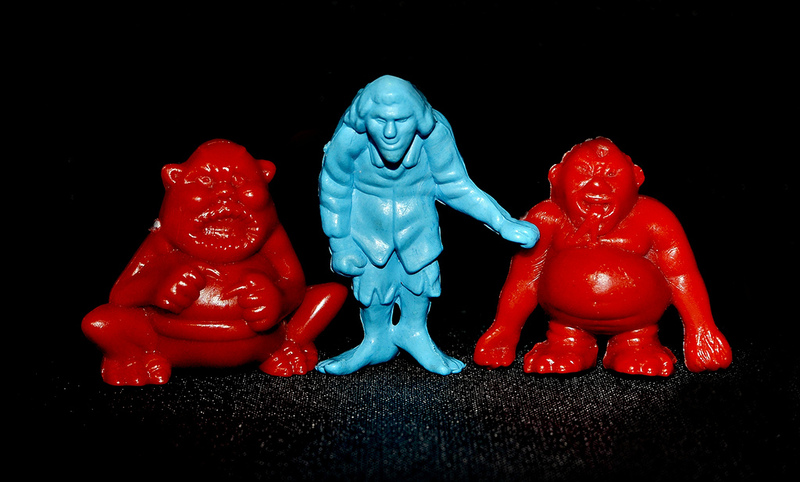 The hunchback caretaker of whatever horror house these guys are from? Or maybe...Benjamin Franklin's re-animated corpse? RIGHT: Here's the brother of tubby monster number one. He's got a pretty similar vibe, but the forked tongue is a nice touch. 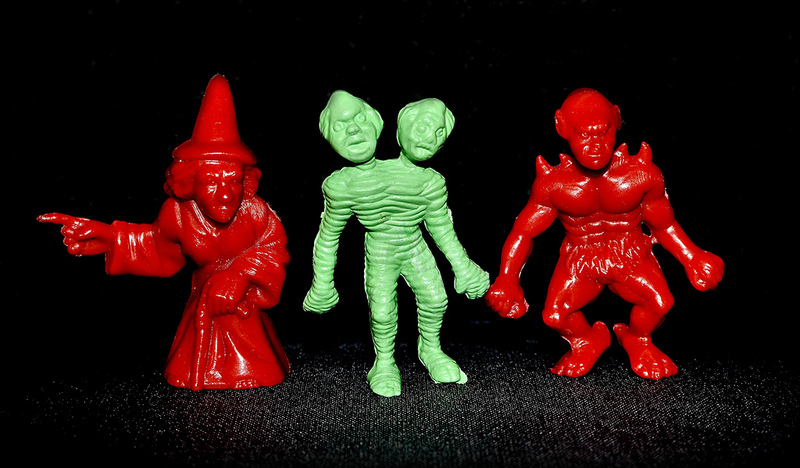 To wrap up, I'll just say that these "Terrible Monsters" have a permanent place in my collection! What about you? What do you think of them? Do you have any in your collection? I was looking for these for YEARS - or at least since I first saw them back in 2006. Got a nice little bunch of them finally in 2012. Not the full set unfortunately, but it DID include the tree, so that's a bonus. The more mysterious a line is, the more fun it is to look for! That's cool that you have one of the trees. I've been on the lookout for one but they don't seem to come up too often. Nice..I got a green "fat roll guy" mixed in with some loose SLUG Zombies off eBay recently and had been wondering about it. Mystery solved! Cool, glad the post was helpful to you! 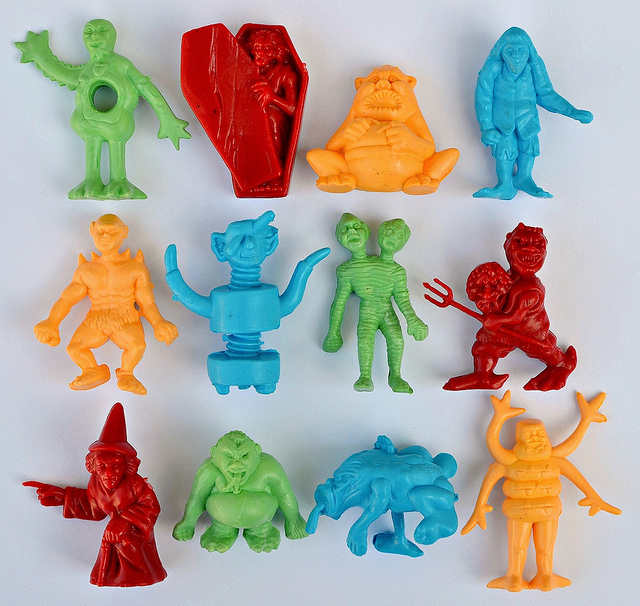 While I never saw them listed in any of the catalogs we received, these were probably offered by Archie Mc Phee/Accoutrements at some point, because we bought a five-pound grab bag of small toys from them in the mid-'90s that included a scattering of these. Interesting! I have ordered some cool stuff from them over the years. I remember when they were selling the Invasion of the Monster Women figures. I already had them at that point, but it was cool to see 'em in the catalog. Just stumbled across this post. You might be interested to know that these are currently being sold as "Bucket of Monsters" in a 62 piece bucket that includes several copies of each along with the trees and a cool skull-castle thing. I guess someone dug up the old molds and recycled them. Thanks, I picked one up a while back but never got around to posting about the new ones here.